Welcomed to the world of 64 Spades. In this Review we will give an opinionated outline and Review of the Poker Room 64 Spades. If after reading this 64 Spades Review and you have an interest in playing over, we will hook you up. 64 Spades is a really new site on the scene. The operate using Enterra Poker Software but are independently managed and licensed to operate outside of the Enterra Poker Network. Their web presence and promotions aren’t exactly the ideal thing you would expect from you average poker sites. Inside of 64s resides lots of private communities and freerolls that are definitely fun and rewarding for any poker player worldwide. 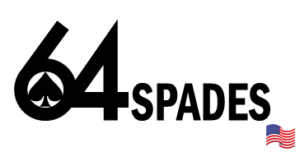 Please keep in mind that while there are some down sides to things that you will see in this 64 Spades Review but overall they are definitely worth it and and their management and marketing team definitely knows how to pack a punch. If they weren’t worth it w wouldn’t have them up on our site. Also please keep in mind it is a fairly new site and there are definitely some things from what I hear that are in development. Without anything further lets get started with the official 64 Spades Review. 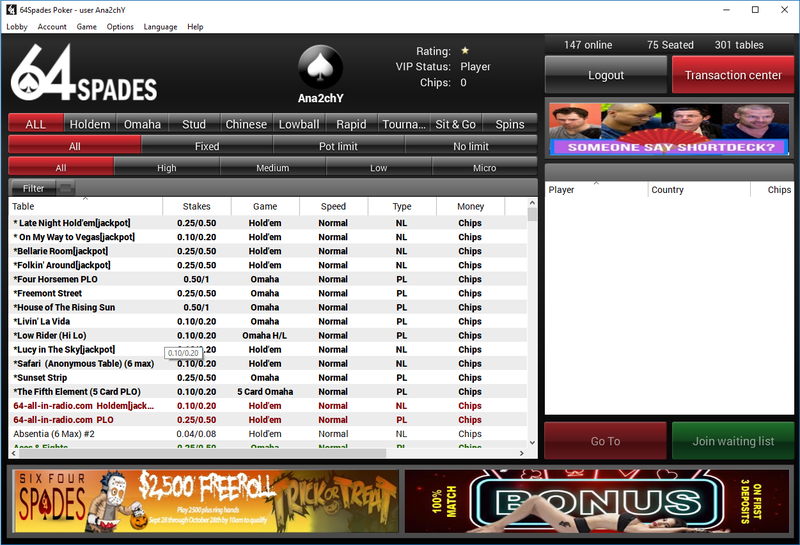 64 Spades offers up a wide range of Freerolls everyday. These Freerolls are either Private or Public Freerolls. Private Freerolls are freerolls that are hosted by private communities / websites that are affiliated and/or sponsored by 64 Spades. Private offer up players a good chance to get involved and talk with new players and people in surrounding communities. One thing I am going to say is that the Freeroll Presence on 64 Spades is definitely something in itself that makes this place worth checking out. These guys definitely have a Private Community presence of which is similar to something you would see on WPN. This is definitely something I wanted to cover in this 64 Spades review. I personally enjoy the engaging with private communities and players when the opportunity is given for independent communities to do their thing. Having private independent communities and supporting their growth is definitely one great thing that 64 Spades is doing really well at. Yea so if you have read other reviews and stuff about this poker site you might’ve noticed that they do not give any real light to 64 Spades Promotions. The reason for this is because the site doesn’t really advertise or have a whole bunch of Direct Promotions that it offers it players. However like I said in the last topic they do definitely offer up some really awesome things for Private Communities and yes there are some promotions that run throughout the month. One of the promotions they have is the $1,000 Freeroll every month that you can qualify for if you play a certain number of ring game hands. The other is the 100% match bonus up to $3,000.00. 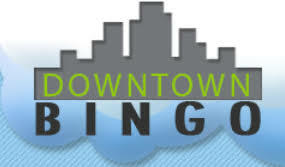 So if your coming here looking for the network to hand you out a whole bunch of freebies and hookups your probably not going to be too satisfied. But between the 2 Promotions that I see they do have and the private communities it surely makes up for this and you can absolutely find some value for your play if you actually try on this site. From what I gather there is no rakeback as of now on 64 Spades Directly. However some affiliates it does seem will offer their players rakeback but it is is on their own terms and is not done directly through the site. I am not sure if they plan on offering rakeback directly through the network at this point but this is currently my grasp on that situation. 64 Spades accepts Credit Cards & Bitcoin. These are pretty standard processing methods and its a pretty standard cashier. Nothing to fancy pretty much right to the point. From our observation and reading through and doing really in depth research it is my conclusion that these guys are definitely pretty solid when it comes down to their Depositing and Withdrawal methods. I don’t see a whole bunch of complaints in this department. There is definitely not a whole people running around playing cash on 65 Spades but at anytime throughout the day it does seem like you will be able to sit down and play some cash if you want to. Its pretty safe to say there isn’t a giant ring game field but if you wanna get down and dirty with it you can absolutely find a game. Most of the energy primarily seems to be coming from tournament play but that could change at any time. During Peak hours it definitely picks up. 64s definitely offers up a decent amount of tournaments for their players. During peak hours you won’t find a shortage of fun. Their schedule is very diverse and it is definitely interesting to see the different types of tournaments they are hosting at any given time. If you are a tournament player looking for some action it might be fun for you to check them out. 64 Spades currently has email support. They are actually pretty quick about responding. Currently there is no phone support. Also keep in mind if you are a VGN Player we offer independent support and will do our best to help you with your issues however the Support Department here is pretty quick at responding. Usually within the hour from what I’ve noticed. 64 Spades has that new vibe to it. I personally enjoy coming up with sites and watching them grow. Hopefully after reading this 64 spades review you have a better understanding of what is going on over there. There is a lot of hype in other 64 spades reviews about everything being glitchy and how the software isn’t good but honestly it feels like a comfortable place to play and can relate to the struggles of trying to go. If you can deal with the small stuff and look more at the community as a whole you can definitely relate to these guys and be comfortable and feel safe playing here. The vibe playing here is a good one. There isn’t a huge field and you’ll run into some regular folks who are true poker enthusiasts. one thing I tried to point out in this 64 Spades Review is that they tight knit group of people who enjoy poker and as a player you definitely have a little bit of opportunity to make some money on here. Aside from opportunity you also have the ability to hangout with some pretty cool people. Here at VGN we are interested to see the future of 64 Spades and are absolutely looking forward to seeing what they are going to come up with down the line. Thanks for reading over this review. While your here make sure you check out some of the other offers we have on VGN after signing up for 64spades.com using bonus code vgn64.